It’s all about the water in Minnesota. If you visited a different lake every day here it would take more than three decades to see them all – yup, there are 11,842 lakes to choose from, meaning virtually limitless opportunities for aquatic adventures: from waterskiing (invented in this very state) to paddlewheel boat trips, there’s a watersport for everyone. Grab a kayak, cram it with camping gear, and explore 2,400km (1,500 miles) of routes in the Boundary Waters Canoe Area Wilderness. Or venture into Voyageurs National Park for a Swallows and Amazons-style experience, exploring hidden islands and trails, and sleeping on a houseboat or lakeside cabin. Landlubbers can stick to pedalling disused railways and lakeside paths or hurtling down the phenomenal mountain bike trails at Cuyana’s old iron ore mine. Golfers have the pick of hundreds of scenic courses, including the 2016 Ryder Cup host, Hazeltine National Golf Club. In the depths of winter, Minnesota completely freezes over, and the lakes and land are transformed into sparkling playgrounds crisscrossed with snowmobiling, cross-country skiing and dog-sledding trails, while hardy anglers bundle up for a spot of ice fishing. 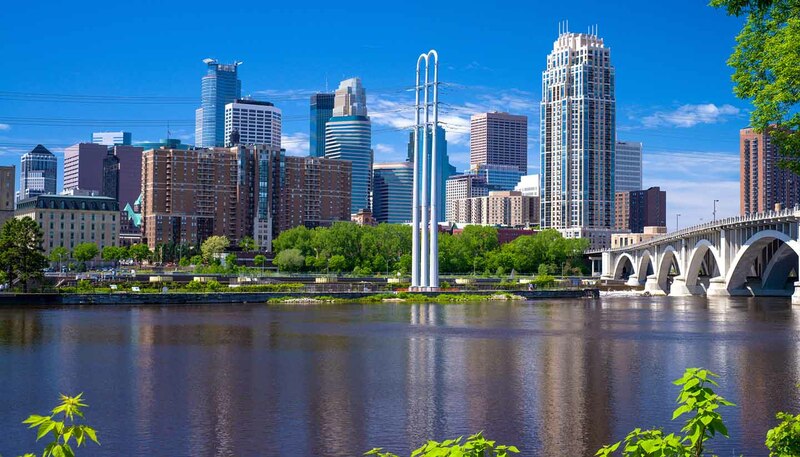 And if all that open space has you hankering after some urban action, the cosmopolitan twin cities of Minneapolis and St Paul are home to the humongous Mall of America, the architectural masterpiece that is the Minnesota State Capitol, and an unstoppable craft brewery boom. Alternatively, Duluth is a busy, big-city port on the shore of Lake Superior, and a gateway to your next outdoor adventure. 225,168 sq km (86,938 sq miles).